We highly recommend that anyone seeking documentation pertaining either to the Laurelwood housing situation at Weapons Station Earle or any other endeavor requiring extensive research of federal documents invoke the Freedom of Information Act (FOIA). With experience as our guide, the coordinators of this program are relentless in their pursuit of fulfilling citizens' information requests - a tremendous service to U.S. taxpayers. NOPE's earliest request yielded a treasure trove of documents, namely the actual contract and more than 70 supplement agreements between the U.S. Navy and its developer (email us if you would like a copy), now called Laurelwood Homes LLC. With such access, we were able to discover that the Navy is bad when it comes to the bargaining table, seemingly giving up its right in 2002 to invoke federal National Emergency rules in order to nullify the Laurelwood housing contract at no cost - all so a private developer could refinance the mortgage and rake in over $200 million in rents for 52 years when all is said and done. We also learned from these documents that, unbeknownst to the public - as should have been disclosed in NAVFAC's "Environmental Impact Statement" (EIS) on the Laurelwood civilian housing plan - that U.S. taxpayers might be on the hook for another $20 million if Laurelwood cannot find tenants for the 300 homes by September 2010. Both sides say NOPE has misinterpreted the language of "Supplement Lease No. 43", but our attorneys beg to differ. Yesterday, another document showed up in our chairman's mailbox - an understated two-sentence letter (attached) signed by then-Principal Deputy Assistant Secretary of the Navy (Shipbuilding and Logistics) Keith E. Eastin in 1988. Apparently, Mr. Eastin, who remains involved in installations management with the U.S. Army, ruled that adding 20 years to the lease (and implicitly signing off on civilian housing at Earle thru 2040) was a good idea to "promote the national defense." 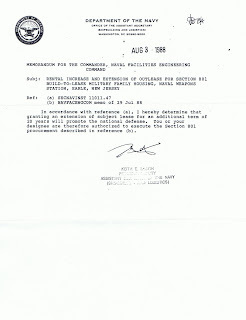 NOPE's legal team will follow up on this letter and perhaps track down Mr. Eastin for further details on the history of the Laurelwood contract and why it was essential for the Navy to open up Weapons Station Earle to civilian occupants for 30 years, rather than ending the privatized Laurelwood housing contract as soon as 2020 (as the attached letter would indicate). Stay tuned for more details. NOPE remains baffled about how civilian housing on an active weapons facility already thin on security personnel promotes the national defense.